Leading up to the Home Tour, we’ll be highlighting each of the architects and their houses in exclusive interviews. You might expect to see the Abeln House, 729 Middle Way (map) in the Cherokee Gardens neighborhood, on the pages of Dwell. 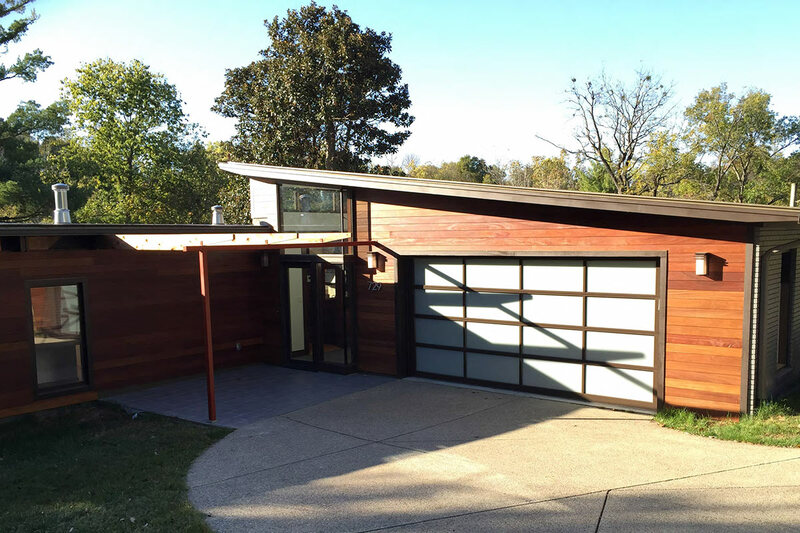 Architect Emily Fisher of Rock Paper Hammer peeled back decades of changes to this 1950s home by architect Werner Louis Feibes, revealing its classic mid century–design details, adding a clerestory and new sloped roof to unite the garage and entry. Broken Sidewalk: What is the physical context of the Abeln House? Emily Fisher: This house is the only one of modern style in the neighborhood—it’s surrounded by more traditional homes. It’s on a sloping lot that backs up to Cherokee Park. To stay true to the original character of the home, while improving functionality and curb appeal. The design was inspired a great deal by the original architect’s drawings from 1953 and the four-foot joist bays that created a rhythm throughout the house. This pattern had been lost with subsequent additions and we returned to it with our new entry addition. Also the horizontal bands of windows informed the new clerestory windows above the entry. What is the heart of this home? The heart of this home is the living room with its original tile fireplace, built-in seating, and wall of glass with backyard views. Since this was all original, however, we can’t take any credit for it! What was a splurge in this project? Where did you find savings? A splurge was the cumaru wood siding and deck. 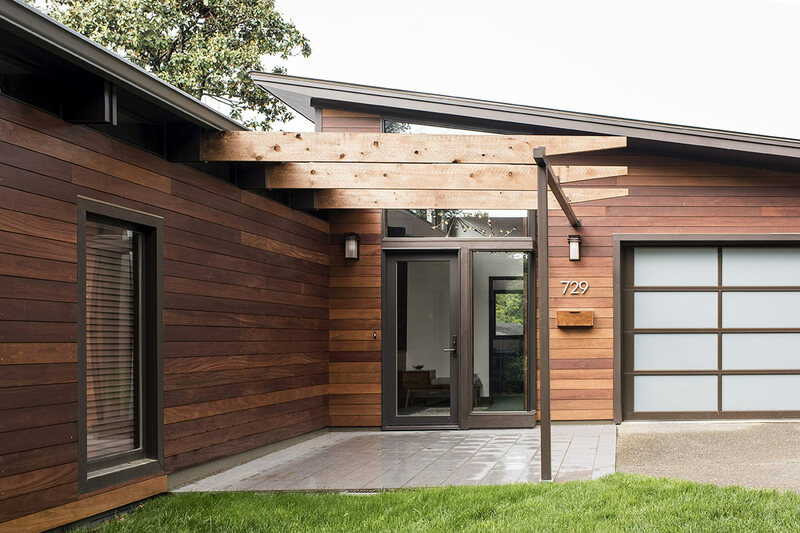 The natural wood siding adds color and texture to the front of the house and also provides a welcome warmth to balance the clean, modern form. 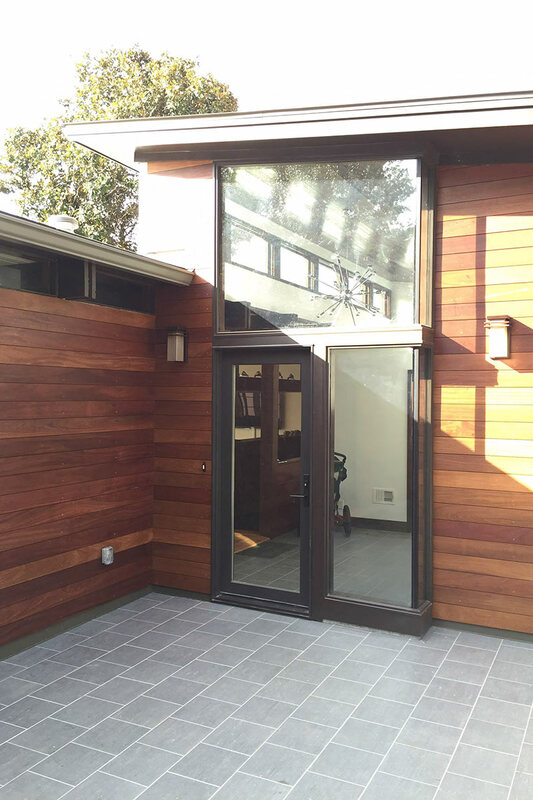 These were important factors to the homeowners when they made the decision for this upgrade, in addition to wanting a unique look at the entry. We found savings by only using the wood siding at the entry where it is most visible, and elsewhere using HardiBoard. Along with the higher price tag of natural wood comes increased maintenance so we did explore some fake “wood” options, but it was ultimately decided that the real wood was worth it. The limited area not only kept the cost lower but will also keep maintenance more manageable. Which design elements are true to the house’s past? / Which design elements are breaks from the past? The new flat roof is the most prominent feature that is true to the home’s original design. When the current homeowners moved to Louisville they recognized and appreciated the design origins of this particular house from the time they lived in California. 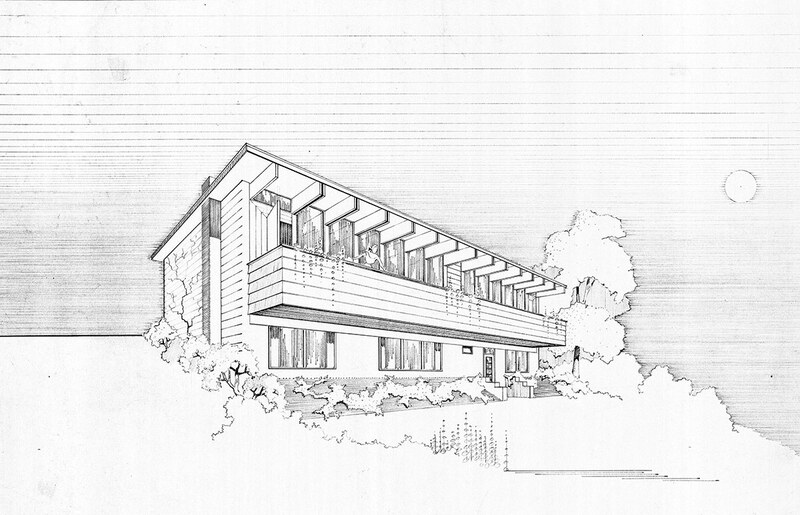 Modern, one-story wood and glass, architect-designed subdivision homes (unique to the postwar suburban building boom of the 1950s and ’60s) that emphasize casual indoor-outdoor living. They often had flat or shallow-pitched roofs, exposed beams, and expanses of plate glass. Garages often faced the street, while living areas opened toward the rear. A signature feature was running materials both inside and out (like the brick for a fireplace) to reinforce the idea that house and site were extensions of each other. The non-original roof that we removed consisted of a single slope “shed” roof that sat on top of the original flat roof. Part of it looked okay from the street but around back the vertical end created an unsightly wall on top of the house. Also the roof transitions at the entry and garage were awkward. Newer design elements that compliment it include the sloped roof and clerestory windows at entry, and the new cable railing at the rear balcony. What is your favorite moment in the house? My favorite moment is inside the new entry when you can tell you are in a new space but you can’t tell where the old ends and the new begins, as it seamlessly flows into the original living area. The new clerestory windows above repeat the pattern of the original clerestory windows, now interior, below them. 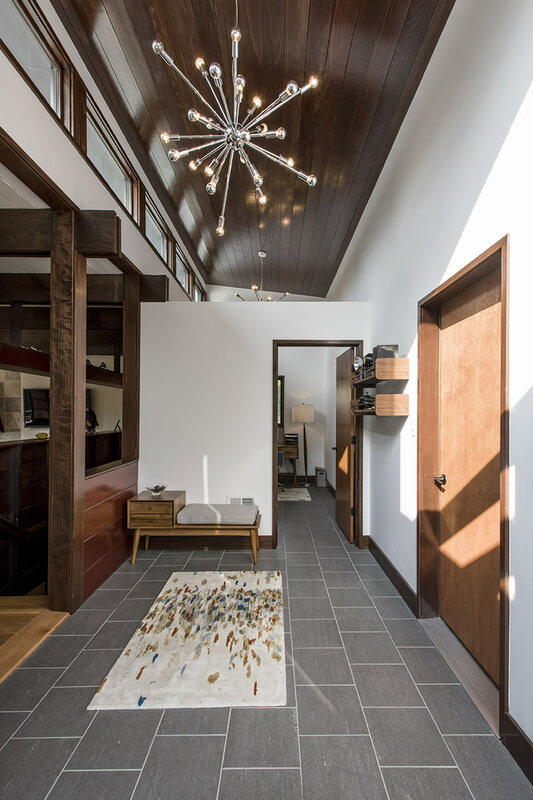 The wood ceiling echoes the natural redwood that is used throughout the interior of the house. What is one of the owner’s contributions to the design? The wood siding (see splurge above) was the owner’s idea, and it totally makes the project! The beautiful backyard and terrace area did not have a good connection to the main living level of the house as they were separated by a full flight of stairs and a solid railing along the upper balcony. 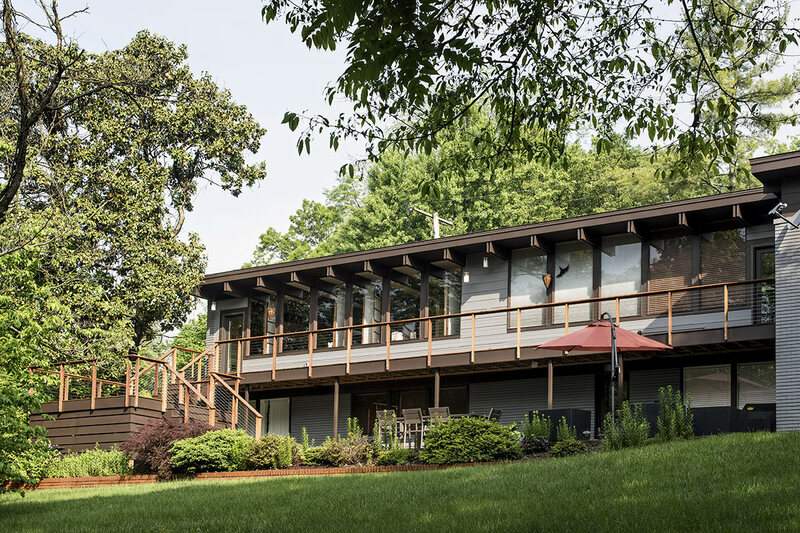 We created a new mid-level deck that bridges the two floors, and added a transparent cable railing system that helps connect the upper balcony with the terrace below. Were there any local vendors or products that you used? The Door Store and Windows for Marvin windows and french doors, Schultze Glass for the irregular shaped windows, Cunningham Overhead Door for the new glass garage door, Emser tile for porcelain tile at the entry.